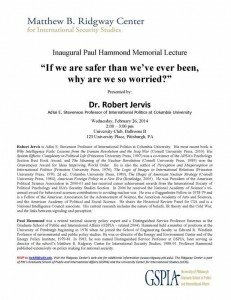 The Ridgway Center is pleased to host the inaugural Paul Hammond Memorial Lecture which will be held on Wednesday, February 26th at 2:00 pm at the University Club (Ballroom B), 123 University Place. Dr. Paul Hammond was named Distinguished Service Professor at GSPIA and later served as director of the Matthew B. Ridgway Center for International Security Studies. 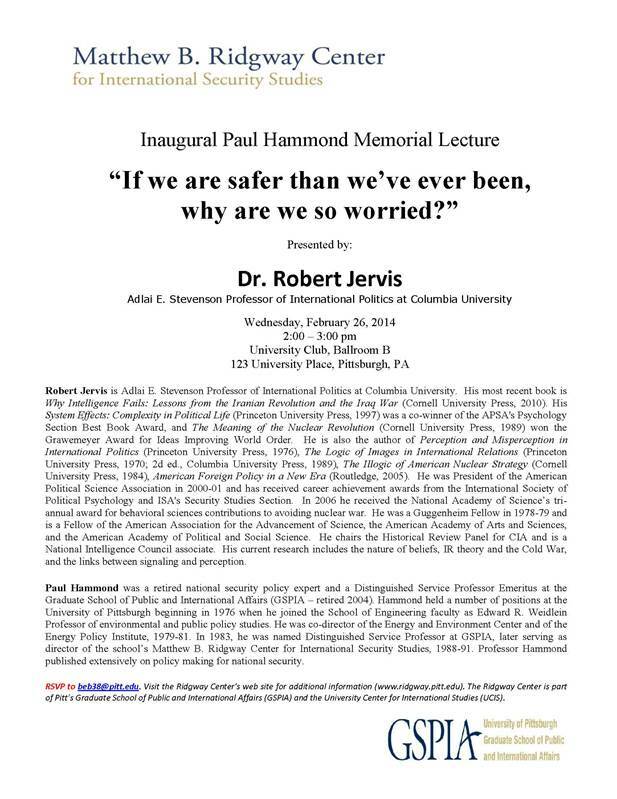 Our guest lecturer for this event will be Dr. Robert Jervis who will discuss “If we are safer than we’ve ever been, why are we so worried?” Please RSVP to beb38 [at] pitt.edu. Refreshments will be available. This entry was posted in Upcoming Events by grick. Bookmark the permalink.